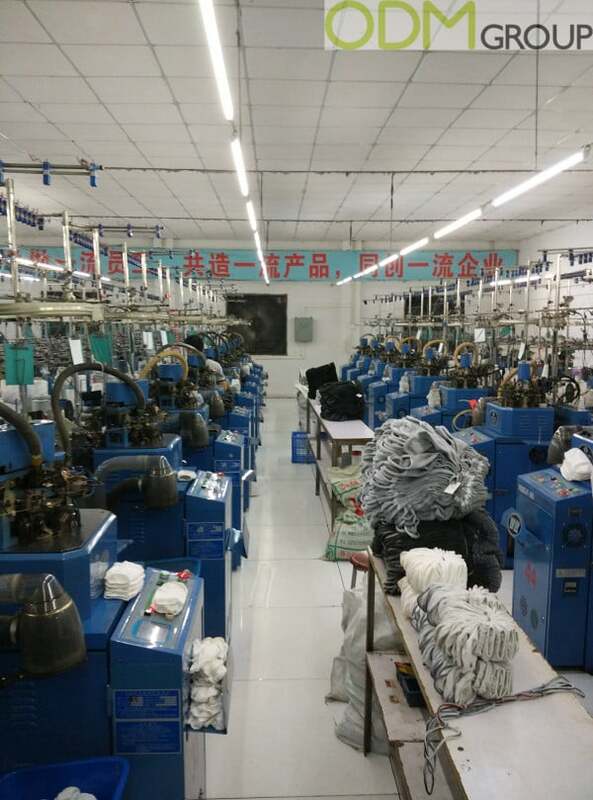 Recently ODM has visited one of our preferred suppliers: a sock factory in Guangdong province. 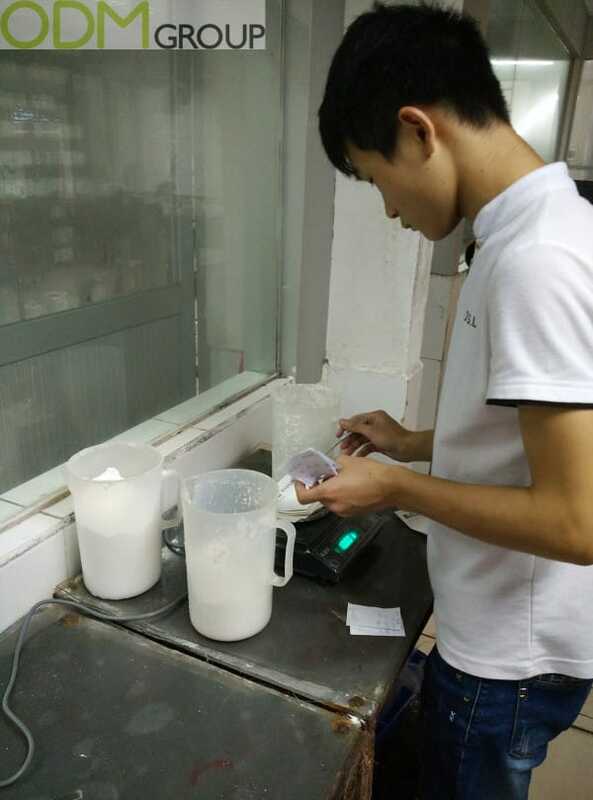 Our goal was to check the production facilities of the supplier; to learn more about the production process and to make sure that the production goes smoothly. 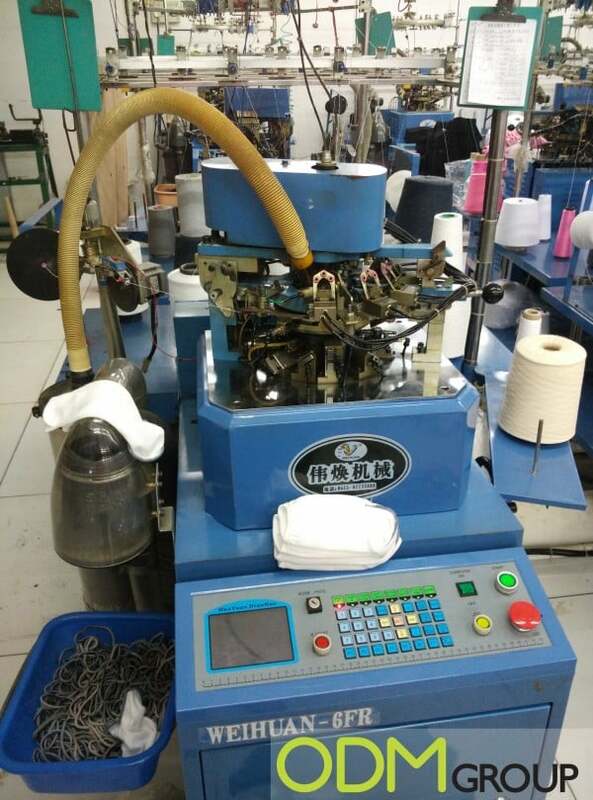 Today we are going to talk you through the production process for customized socks. 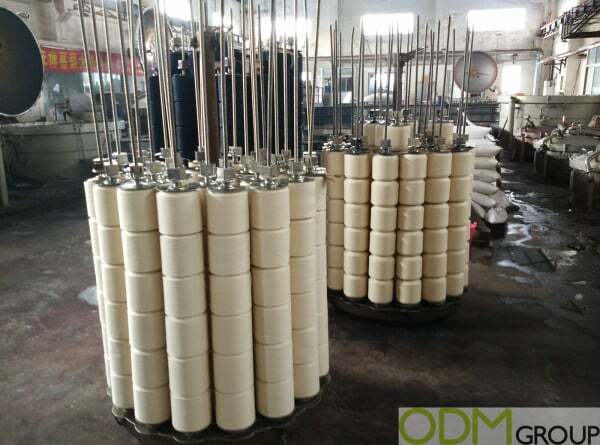 Factory visits are a great experience and ODM are happy to share with you. Our factory trip started with a visit to the raw material supplier – the sock factory partner which is specialized in making different types of yarn and dyeing it according to the Pantone colour. When manufacturing you need to also have full control of the upstream supply stream. The production process starts at the laboratory, where specialists calculate the amount of ink/colour that they need to use to match the requested Pantone using the computer program. Important to find right proportion of other chemical substances necessary to keep the colour and prevent it from fading. The machine on the picture below is testing a few different combinations to see which one can make the closest pantone match. 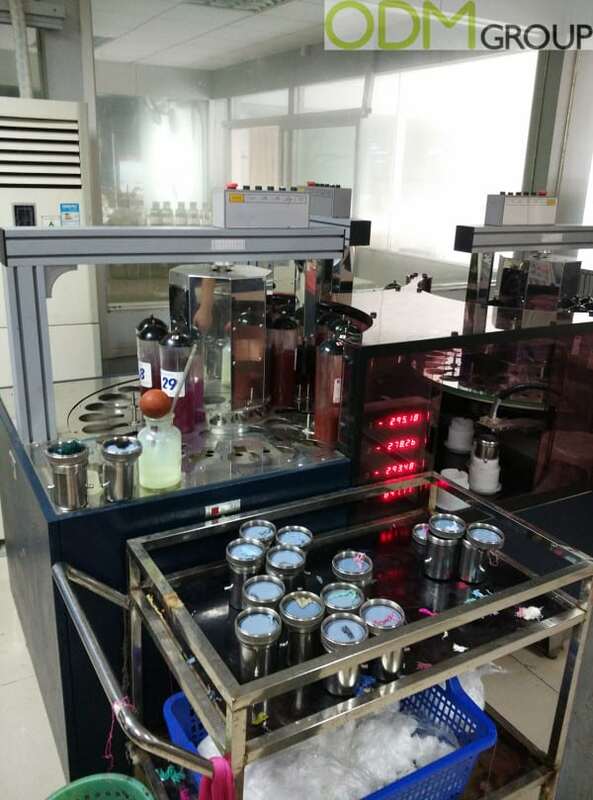 First swatches are also made in laboratory in a small container in order to confirm the colour with the client. The production hall has more than 20 large and small containers. In order to customize yarn minimum order quantity for each panton matched yarn is about 50kgs, or about 2000 pairs of socks. Big container can dye yarn for nearly 200 000 pairs of socks. 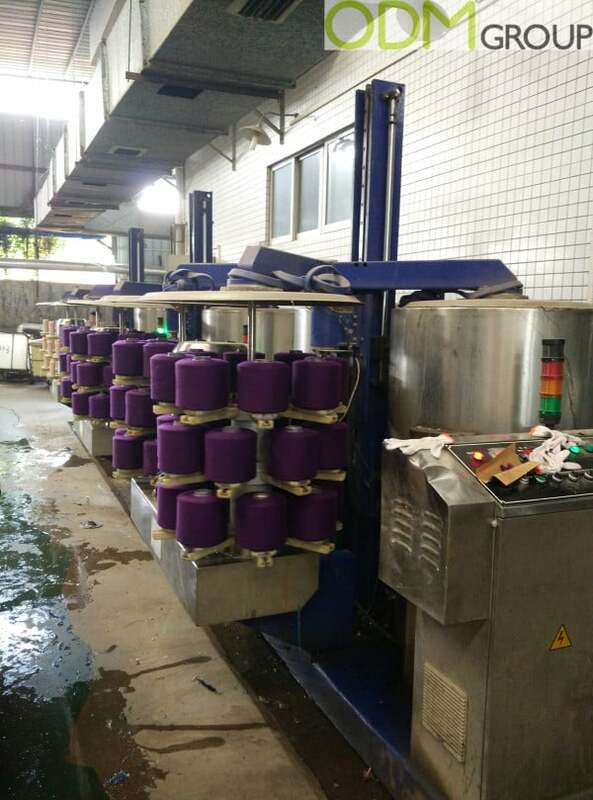 Reels with plain yarn are being placed on the special metal construction and loosing the yarn, so the ink can dye all yarn properly. The crane is placing the construction in the container with dyeing solution. After this process the reels are moved to the next machine. The principle of operation is similar to the centrifuge – the reels are spinning around on a high speed inside the container, which allows them to get rid of the extra water and get dry quicker. To dry the yarn completely the reels then go to the next machine. It looks like a big oven and with high temperature reels with yarn getting dried very quickly. 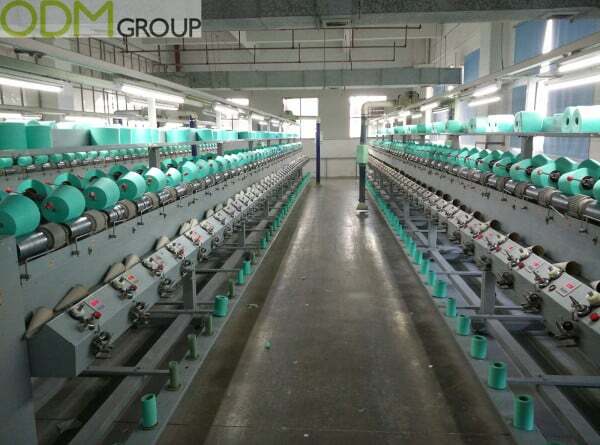 All machines at the factory are automatic and once the drying session is finished the reels can be moved to the next production hall. 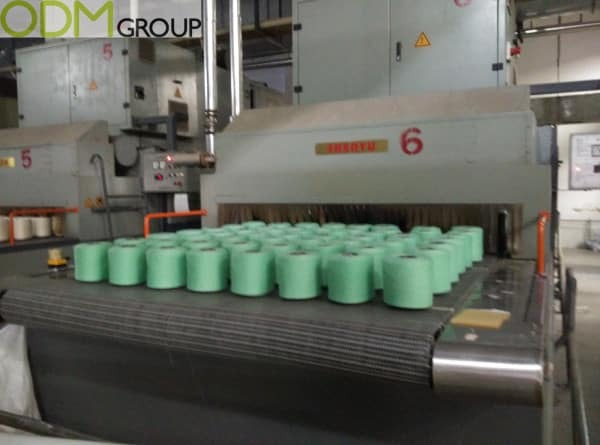 On the picture below you can see how the machines are rewinding the reels using the different shape of the plastic base which is more convenient to use in production. Once reels are ready and packed they are being sent to the next factory to manufacture socks. On this visit to the sock factory we were checking out the pre-production stage, which is still a critically important phase of production. Samples can be remade numerous times to get a perfect product. 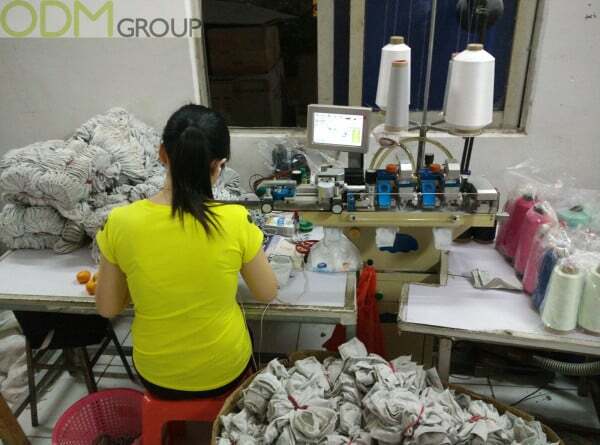 Here we were adjusting different specifications to get a good sample and start production. It takes about 3-4 minutes to knit one sock depending on the complexity of the logo and size. is 8000-12000 pair per day. The size of the sock can increase in circumference by using a bigger needle. For example, 168N is a standard size for the western market. 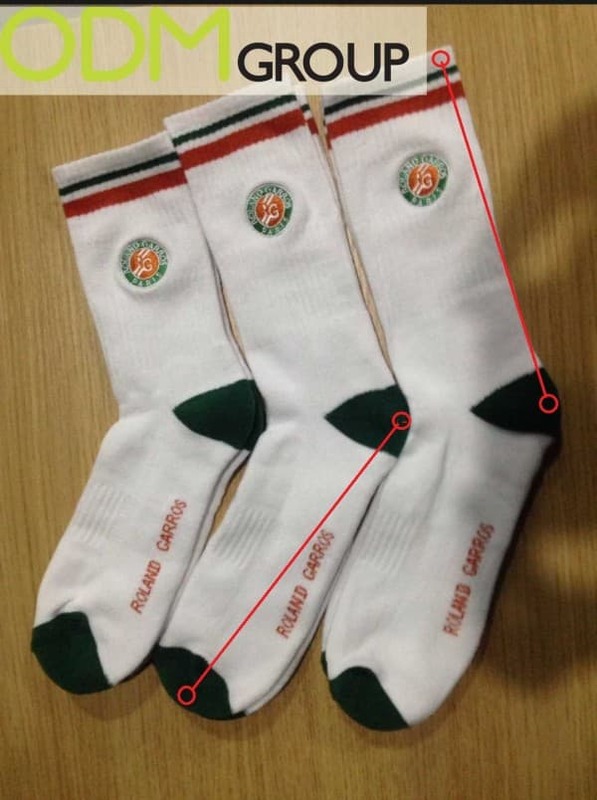 If you reduce size of the sock logo, you can avoid untrimmed threads connecting 2 logos together. Please see the image below for your reference. This makes socks more elastic. 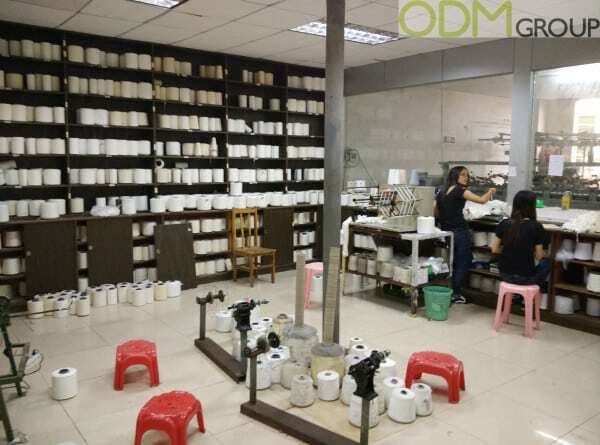 Comparing your pre-production sample and mass production item you should make sure that both samples are unstretched and brand new. Only in this case the dimensions of the product are accurate. Check the image below – red lines indicate how to measure the size correctly. Freshly made socks have a lot of moisture and you should keep in mind that it can slightly affect the size and weight of the product. 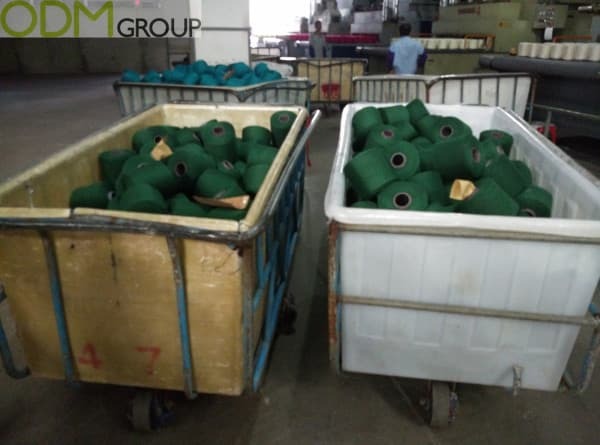 Please check our video below to know more about the production process. Here at ODM we have years of experience in fabricating promotional products. Feel free to get in touch and let us assist you in coming up with some new and innovative ways to promote your brand.